Many immigrants coming to the United States are, in the early generations, uncertain of their status and may often be stereotyped as un-American or unassimilatable. With some frequency, leaders of those immigrant groups have erected statues or monuments to illustrate that the group made important contributions to this melting pot nation or to show that the ethnic group’s history shares many elements of the history of the United States. There is the impressive statue of General Thaddeus Kosciuszko at Michigan Avenue and Third Street and another one of Casimir Pulaski at Michigan Avenue and Washington Boulevard. The statue of Johann Friedrich von Schiller reminds us of the German contribution to the literary heritage this nation shares with Europe. The impressive bust of Dr. Martin Luther King in the small park at West Grand Boulevard and Rosa Parks and the fist of Joe Louis in the median at Jefferson and Woodward remind us of the contributions of African Americans. Although Italian immigration to Detroit was modest in size, Vincenzo Guiliano edited an Italian language newspaper in the city at the turn of the last century, the Italian Tribune of America. 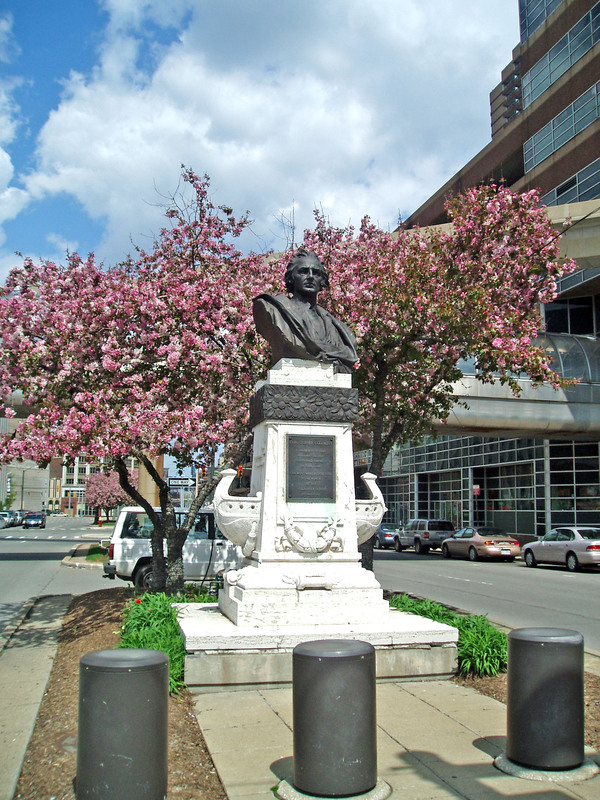 He believed that there should be a prominent Detroit memorial of the important Italian captain who is credited with discovering America, so he commissioned the sculptor, Augusto Rivalta and arranged to have the statue displayed at a prominent location. Christopher Columbus was born in Genoa in the fall of 1451. In the Genoese dialect of that era, he was known as Christoffa Corombo. Columbus is the Anglican zed version of his name but you will find many variants since he worked and lived in Italy, Portugal, Spain and, perhaps, in England. He apparently completed little formal schooling even though his father was a skilled wool weaver. As a teenager, he went to sea and spent most of the rest of his life sailing except for the final two years when he lived in Spain. Columbus was fascinated by stories of Marco Polo’s remarkable overland voyage from Italy to the Orient in 1271. Indeed, substantial trade occurred on that route until 1453 when Constantinople fell to the Turks. Westerners were no longer able to maintain a trade route across the Islamic area leading to much interest in a water route to Asia. There was considerable knowledge of geography and the spherical shape of the earth at this time, but no one was aware of the diameter of this globe. Actually, the Greek astronomer Eratosthenes of Cyrene determined the circumference and diameter of the earth in about 190 BC. For him, it was as easy as pi, but his finding were not known by Columbus and other Fifteenth-Century mariners. They erroneously thought that earth was much smaller than it actually is. Columbus traveled throughout the Mediterranean and the western coast of Europe and the Atlantic coast of Africa. . He may have sailed as far as Iceland in 1477. As early as 1484, Columbus tried to convince the Portuguese king, John, to finance an expedition that would sail to Asia by going west from Europe. He had no luck convincing the Portuguese to make that investment. In 1491, Columbus successfully obtained support from Ferdinand II and Isabella I in Spain for an exploration to sail west to reach Asia and its gold. On August 3, 1492, three ships departed from Spain, the Niña captained by Vincente Yañel Pinzon; the Pinta captained by Martin Alanzo Pinzon; and the Santa Maria captained by Columbus. The crew totaled about 90 sailors. Columbus was very surprised by the length of his journey. Finally, on October 12, 1492, Columbus and his compatriots sighted land. He expected large cities and much gold. He found small islands and a few Indians. He put off 39 of his crew on present day Haiti to found a Spanish colony and departed from the New World on December 25, 1492 with about 25 Indians. He got back to Spain on March 15, 1493 believing that he had reached islands near Japan but had no gold to deliver to Ferdinand and Isabella. Columbus led three more trips to the Caribbean and Central America, believing that each one would be the successful one that would take him to the fabulous destinations Marco Polo had reached two centuries earlier. By the time of his second voyage, other Spanish mariners were taking up the search for gold, and Asia and the Spanish government began sending officials to administer the developing colonies. Remarkably quickly, the Spanish were populating the Caribbean isles. On his third voyage, he sailed to Panama and learned of the Pacific Ocean to the West, but I do not know if he realized that it was necessary to cross that body of water to get to Asia. His third voyage ended poorly since he believed numerous crew members were insubordinate and had some of them hanged. Local Spanish authorities in the New World complained of his cruel behavior, arrested him and sent him back to Spain in chains. I believe that Columbus also thought that he should be or would be appointed governor of the colonies, but other administrators disputed that some political intrigue bedeviled Columbus shortly after his discovery of America. Columbus exonerated himself at his trial. His last voyage was from 1502 to 1504. By this time, the Spanish had successfully colonized several Caribbean islands and gold was being taken from the New World to Spain, but in much smaller quantities than expected. Colonial authorities apparently disliked Columbus very much and, after returning from his fourth voyage, they had him arrested and he was held in jail for six months. He lived out his days as a fairly rich man because of the gold he had acquired. After his death, his heirs conducted prolonged litigation to obtain a share of what they believe was rightfully his. The sculptor was born in Alessandria in northern Italy in 1837 and studied art in Florence. He eventually won many commissions to sculpt large statues of Italian heroes, many of them displayed now in Rome, Florence and Livorno. I do not know of any other of his works in the Detroit area. He died in Florence in 1925.